Hollywood continues to demonstrate that it won’t be satisfied until every last item from our childhood toybox has been developed into a movie with the announcement today of an animated Cabbage Patch Kids film, headed to a small screen near you. Really, the only unexpected thing about this news is that it’s taken Hollywood this long to get around to building a movie around the beloved dolls. Hit the jump for more. Producer Galen Walker, who’s also working on the live-action Teenage Mutant Ninja Turtles movie, has obtained the rights to the toys. A script is currently being written for a TV special to revolve around the dolls, though no plot details have been made public at this point. Somewhat surprisingly, this is only the second time the Kids will be on the small screen — their last TV appearance was a highly rated Christmas special way back in 1985, near the height of the Cabbage Patch Kids craze. If the new special does well, my guess is that we’ll be seeing more of the Kids, perhaps in the form of a TV series. The Cabbage Patch Kids were first introduced in 1978, but didn’t become really huge until the early ’80s, when they became the kind of toy fad that sparks actual riots among shoppers. The brand has been passed among several different companies over the years, including Coleco, Hasbro, Mattel, and Toys ‘R’ Us. The toys remain in production today, and even make occasional attempts at topical relevance — check out this weird photo of the Barack Obama, Joe Biden, John McCain and Sarah Palin Cabbage Patch dolls from 2008. With the news of their TV movie, the Kids join a long, long list of toys that have made the jump from the toybox to the screen — including G.I. Joe, the Transformers, Battleship, Candyland, Risk, even Major Matt Mason. Can a Popples movie really be all that far off? Or a Furby one? Discuss: Well, can it? 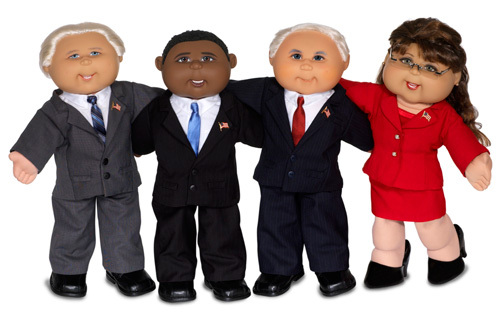 Also, how creepy are those presidential/vice-presidential candidate dolls?